Remember ladies and gentlenerds, the Hugo nominations are due in less than 48 hours. While, of course, I would like you to nominated Sad Puppies Bite Back and Honor At Stake on your ballots (SPBB in every category, if possible -- I'll need all the help I can get), but please, pick whatever the bloody heck you like. What I like shouldn't impact you or your choices in the least. I never really thought my book was so awesome as to warrant a Sad Puppy suggestion, but heck, I'll take a Hugo nomination. It would be interesting. Remember, this is The SP4 List. And you can vote for something else if you like. Heck, someone even told me they were going to vote for A Pius Geek as a FanZine, which took me totally by surprise, since I didn't even see it on The List (though it might have been in the spreadsheet, I honestly didn't look). If you want, however, my suggestions ... I don't have any. Keep in mind, I haven't even gotten around to reading all of the freaking best novel nominees yet, so you know I'm behind. These are the best novel suggestions. As I've said, Ringo and Correia don't want a Hugo. So I wouldn't waste the vote. Ann Leckie did a cute trick with her first Ancillary book, but she's already got a Hugo, so toss a coin on that one. And Brian Niemeier wants a John C. Campbell award. So, check out Nethereal just in case. This leaves us six books left ... If you can't guess, yes, I would recommend my own novel, for reasons I'll go into below. I would also recommend Butcher, and Wright. I've read the Butcher, and what I'm reading of Wright makes me want to just hand him the award. Sadly, Novik lost me when her Dragon series ran at least one book too long (I think they rewrote Waterloo to be a draw and I said "Nope. Thanks. I'm done."). And after that, all that's left is Williamson and Stephenson. Stephenson has gotten a few Hugos, so I'm not worried. As for Williamson ... you'll have to read him to get why. By the way, while I remember, Lou Antonelli posted something in a FB group of mine recently, so I think he'd like it if I passed it along. Obviously, as far as my stuff goes, I'd love to go in for the maximum amount of Puppy-Kicking discomfort. Like, you know, Best Novel, Best Related, and Best Fan Writer. I would love so see some of the comments at 770 call for my head. Please, 770 schlubs, I want you to. BWAHAHAHAHAAH. (And yes, for those people who would like me to be precise in my provoking, I mean the guys in the comments section who are insane, not Glyer in particular). I also await the bitching that my SP parody last year is a series of "death threats" -- yes, really. Some have said that. I think that will be especially amusing as they all going insane. I mean, hell, the ones who think I'll destroy SP4 were already amusing. However, just for some amusement at my expect, as I was rereading that post from last October, I came across a line of mine that's hilarious in retrospect. 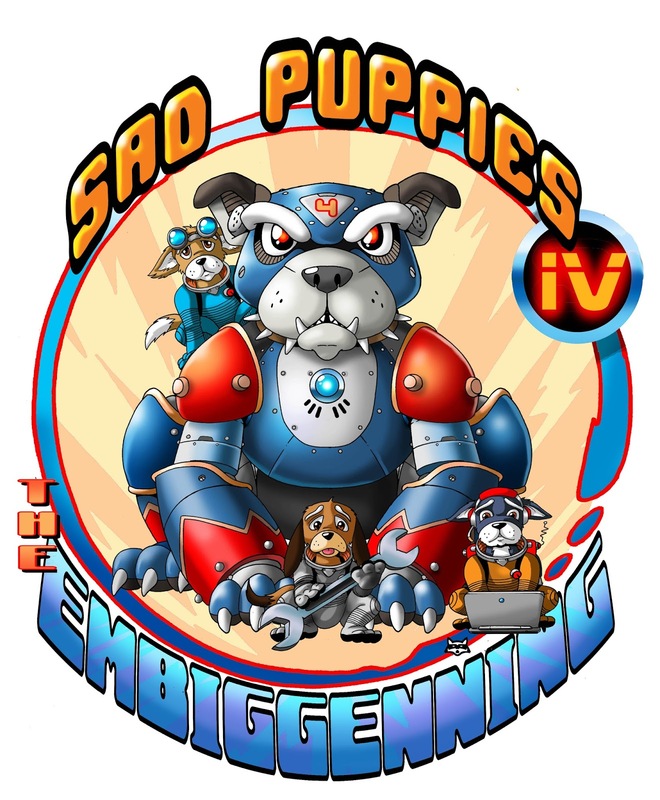 I think my "popularity" has to do with the fact that the year isn't over yet, and voting for Sad Puppies 4 is about two months old. And now you understand why, even though I'm relatively certain I'd be hard-pressed to even get a single nomination (really, just one), I'm not ruling anything out. Why? Because I didn't expect to get this far. 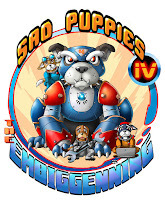 And Sad Puppies Bite Back might be something I could win. Best Novel? Heh heh heh. And I'm really surprised I got even the SP4 suggestion in Best Novel. Think about it: I don't know any of the Big Dogs personally. I'm hardly "a Name." 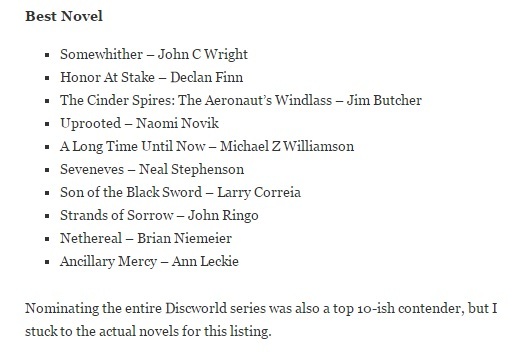 Seriously, I'm on a list with, what, 7 or 8 NYTimes Bestselling authors? Now, obviously, it's hardly head-scratching. At the end of the day, Sp4 suggestions went to the people whose fans showed up. Mine did. And I'm ever so grateful for that. And I'm not sure I can ever thank my fans, and my friends (all three of you), enough for showing up. I'm surprised, I"m honored, I'm touched ... touched mostly in the head, but that's nothing new ... and I'll be interested to see just how far this goes. Because I'd really like to show up at WorldCon with a full-sized SP4 t-shirt, and recording the reactions I get. Maybe if Patrick Nielson-Hayden would want to get into a shouting match with me, and see how far that goes, hmm? Now, pardon me, I have nearly 66,000 words and 217 pages done in Set to Kill, so I should probably get back to it.